Specs Around Town is more than just an optical boutique. Owner, Julie Kubsch, ABOC has worked in the Ophthalmology and Optometry industry for over 35 years. Julie has been a dispensing optician since 1981 and has her Associate Degree in Ophthalmic Dispensing. Julie and her staff bring a special kind of care, passion, style and expertise in helping their clients choose the best eyewear for their lifestyle and vision needs. Eye health is the result of a working partnership between you and your eye healthcare provider. Ophthalmologists, optometrists, and opticians work collectively and with the patient to ensure good eye health and life-long vision. You should visit your optometrist or ophthalmologist for an eye exam at least once a year. The staff at Specs Around Town Optical Boutique offer these helpful eye care articles for your benefit. Crizal No-Glare lenses are the market leader of No-Glare (Anti-Reflective) ophthalmic lenses. 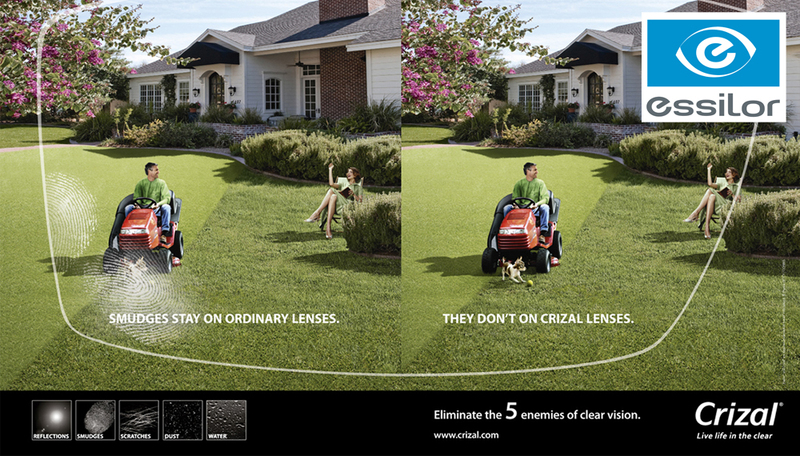 Look Better - Crizal lenses are clean, clear, and glare-free so they're virtually invisible to those around you. Polarized sunglasses have been popular for years with boaters and fishermen who need to reduce reflected glare from the water surrounding them. Now that many others who spend time outdoors have discovered the benefits of polarized lenses, interest in these types of sunglasses has soared. Additional outdoor enthusiasts who benefit from polarized sunglasses include skiers, bikers, golfers and joggers, all who may enjoy a clearer view along with elimination of glare. These sunglasses can be used for driving and, in fact, can reduce glare from a long, flat surface such as the hood of the car or the road's surface. Light reflected from surfaces such as a flat road or smooth water generally is horizontally polarized. This means that, instead of light being scattered in all directions in more usual ways, reflected light generally travels in a more horizontally oriented direction. This creates an annoying and sometimes dangerous intensity of light that we experience as glare. Polarized lenses contain a special filter that blocks this type of intense reflected light, reducing glare. 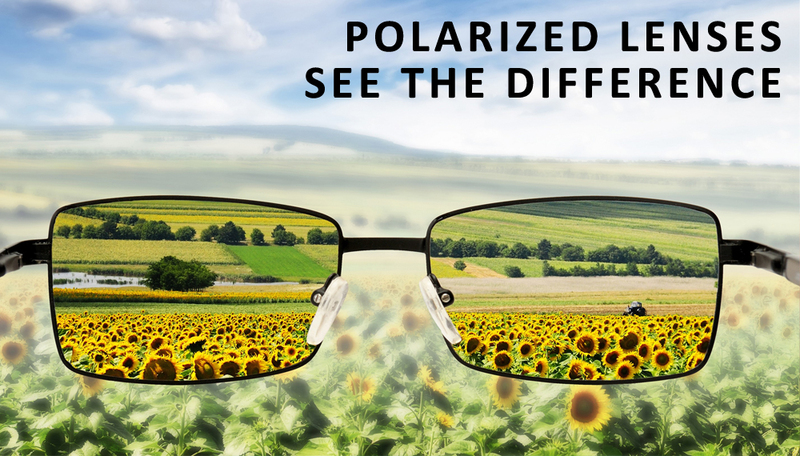 When could polarized lenses pose a problem? Skiing in icy conditions. Patches of ice are easily identifiable as they reflect more light than snow. Wearing polarized lenses will make icy patches more difficult to see. Spotting oil or icy patches on the road. For the same reasons above, we do not recommend using polarized lenses for riding motorbikes. Viewing liquid crystal displays (LCDs) - Polarized lenses can make the liquid crystal displays of certain objects more difficult to read. As most modern motorbike instrument’s and the instrumentation in modern aircraft have LCD displays we do not recommend their use. Few people properly clean lenses, resulting in scratched products that require remakes. Despite advances in top and hard coats plastic and even glass lenses can still get scratched. Scratches make seeing stressful and tiring, affect impact resistance, and weaken lenses. While most everyday products won't do immediate damage to lenses, independent testing shows significant damage after a year of regular use is simulated. Clothing. Clothing and dirt particles in clothing can leave fine scratches on lenses. Dish soap. A few mild dish soaps won't harm spectacle lenses, but extra-strength dish soaps can slowly disintegrate lens coatings. Glass cleaners. Highly corrosive glass cleaners are not made for non-glass material. Tissue/paper products. Dry paper products can grind dust and paper fibers into lenses, resulting in scratches. Even with water, paper can't remove oils, most sprays (like hair spray), or fingerprints. Rubbing alcohol. While often used to remove ink marks needed for cutting lenses and marking progressive lenses for accurate measurements, long-term use of rubbing alcohol can damage lens coatings. If running water is available rinse lenses off well to remove any debris that could scratch lenses. Liquid cleaner. Spray both sides of the lens. 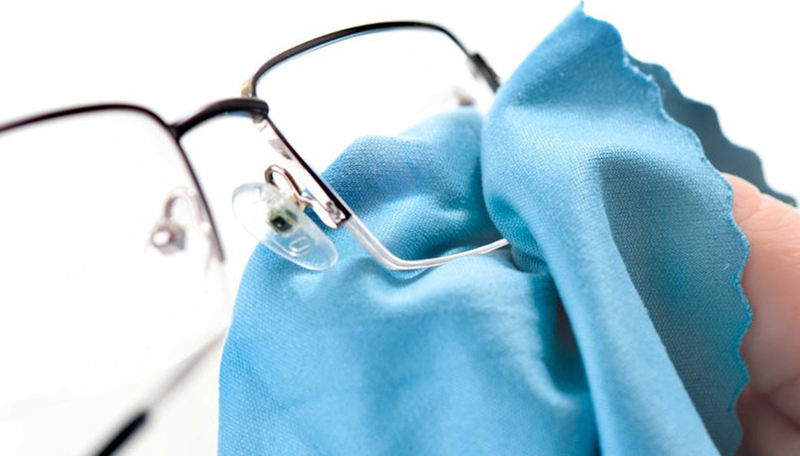 Using a clean microfiber cloth and gentle pressure, wipe the cloth over the lens surface. Pre-moistened lens towelettes. Rinse lenses under running water first if there are large dirt particles. Unfold the towelette, and, using gentle pressure, wipe the lenses clean. Microfiber cleaning cloths. Liquid is best, but if dry cleaning must be done, use a clean microfiber cloth, not clothing. Research shows that 52 percent of people use clothing—which causes the majority of lens damage—as their top method. You are the generation that rocked the world. You are the Baby Boomers - and you carry more social and consumer power than any other generation in America. You brought the world rock and roll, Woodstock, the sexual revolution and civil rights for all. You've seen a president assassinated, the Beatles come to America, the Vietnam war and the birth of Microsoft. But you can't see the menu without holding it halfway across the table. 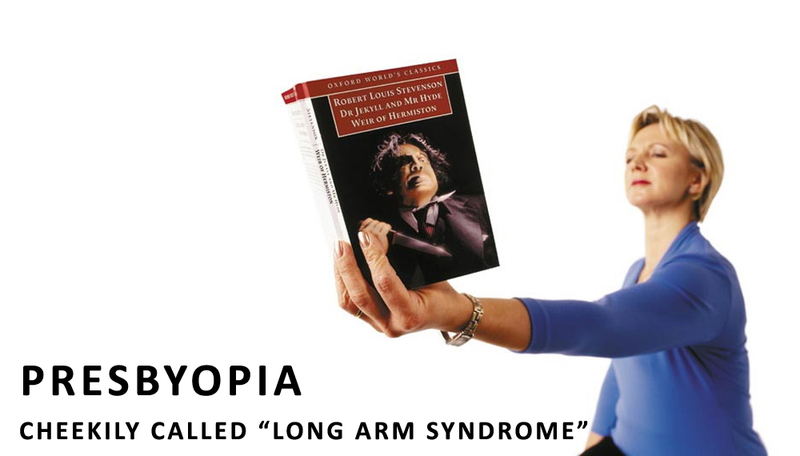 It's called presbyopia, and it's the natural, gradual loss of the eye's elasticity and the ability to focus on objects close up. It happens to most people as they reach the age of 40 or 50. Progressive lenses are the most technologically advanced solution for presbyopia, offering the closest thing to natural vision. A clear field of vision, allowing you to take notes while viewing a presentation. Immediate visual correction, allowing you to switch seamlessly from computer work to other activities, or read a magazine and watch TV at the same time. True peripheral vision, which allows you to participate in sports and see cars entering from side streets while driving. Ease of wear - which means you'll feel natural wearing progressive lenses and stop switching glasses forever. Last year 10 million computer users sought eye care for computer related complaints - eyestrain and fatigue; headaches; burning, red and dry eyes; blurring of the screen; distance blur after working on the computer; and intermittent double vision. 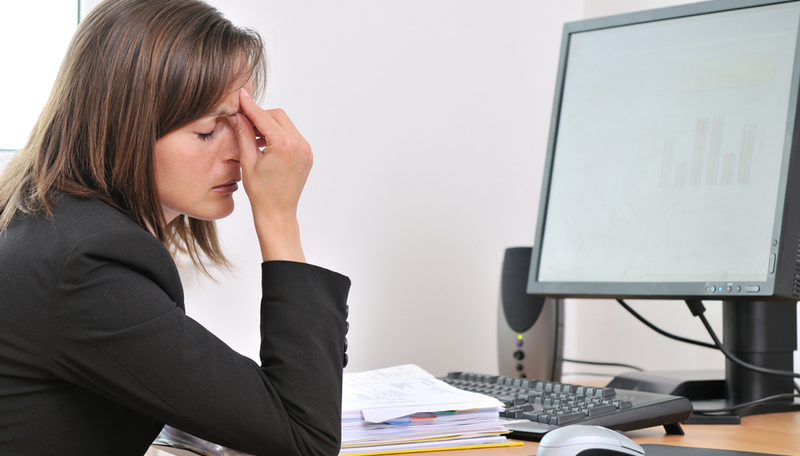 Studies show that 50-90% of computer users have visual symptoms. At Specs Around Town we will discuss computer eyewear solutions with you. Occupational multifocals, computer lenses, progressive additions lenses, anti-reflective coating, lens tinting, lightweight lens materials and proper frame selection and fitting can help you obtain significant relief from CVS symptoms. Here are a few simple suggestions for relieving CVS. Place monitor 20-28 inches from the eyes and position it so you are looking down slightly. Use an adjustable holder placed close to the monitor for reference materials. Blink frequently or use over-the-counter artificial tears to moisten eyes. Give eyes a break by frequently looking away from the monitor for a few seconds. Keep glare on the screen at a minimum by turning the monitor away from the window, avoiding strong overhead lighting or using an anti-glare screen. A lens designed especially for computer and office use, is a progressive with no distance zone--just wide intermediate and near zones positioned for either viewing the screen or the desk. With wide, clear vision out to ten feet, computer lenses are perfect for helping to ensure comfortable vision while working in your home or work environment..